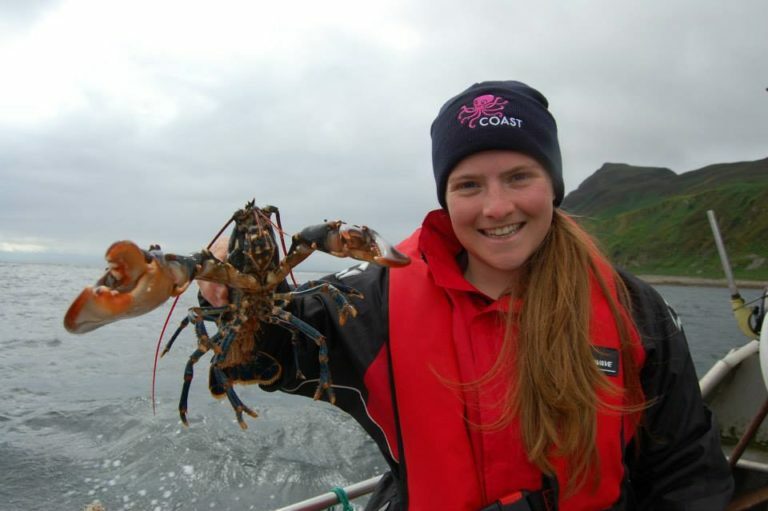 This week we’re with Jenny Stark who is the Marine Outreach Officer at COAST. Like so many of our interviewees, it was volunteering (and making an impact during that volunteering) that led to Jenny landing a job doing what she loves. Growing up I always had a love for the outdoors and animals. I was lucky enough to be taken on some amazing family holidays, where I first set eyes upon the wonderful marine life we have in our seas. Being able to see animals that are so colourful and have such weird adaptations was fascinating. So, when the time came to decide on a career path, Marine Biology was an easy choice and as I progressed through University and learned more about the subject, I became more interested in focusing in on the conservation side of things. Following my BSc I travelled around the world and participated in various marine conservation projects. Coral reef health and fish biodiversity in Fiji, as well as turtle conservation in Vanuatu, saw me interacting with a variety of people with different backgrounds and knowledge. Helping educate the local communities in these deprived areas was rewarding and, following a 4-month stint as a Dive Master where I got to call the Great Barrier Reef my office, I returned to the UK to begin a Masters in Marine Environmental Management to help progress my career. Part of my MSc required me complete an on-site placement during the final few months of my course. I was lucky enough to come up to Scotland to work for COAST, conducting underwater baseline surveys of the seabed within the [now legally enforced] South Arran Marine Protected Area. Upon completion of this placement, I was invited back to volunteer for the charity, helping them out with their marine projects. Whilst there, funding became available for them to increase staff capacity and I was lucky enough to be offered the new position of Marine Outreach Officer. Being out and about and interacting with various people is by far the most enjoyable part of my job. This includes talking to local community groups to give them an update on what COAST is doing, being at a stand with a touch tank at big island events, or going to talk with school groups, both local and mainland, and inspiring the next generation to get involved with marine conservation. On several occasions, at the end of lessons, I’ve had children come up to me who have said “That was amazing! When I grow up, I want to be just like you and protect the sea”. I can teach about 100 children a month about marine conservation, and if I can inspire just one of them to pursue a career in marine biology, then I feel like I’ve done my job well. Many people think that being a marine biologist is all “let’s get in the water and play with the cool animals”. Yes, parts of my job are like that but in reality a lot of it is desk work, especially when you work for a small charity. However every bit of desk work you do is every bit as vital as the outdoor fun and all aspects come together to achieve the same goal. My keen ability to problem-solve has come in so handy over the years. I never thought I’d need to be able to do computer tech as a marine biologist but I have become the ‘go to’ tech person in our small office. Stick in there and get out there! Go and explore, find out for yourself what wonders lie beneath our oceans and how you can help. Anyone, no matter what age, from what background can make a difference. From a 3-minute beach clean to reducing and recycling waste, you can help protect our oceans. You don’t need to be paid to make a difference and sometimes starting out volunteering leads to paid positions, so stick at things and give them time and you’ll eventually reach your goal. This question is so tough. I have an unhealthy obsession with sharks, which are just fantastic animals and I also have a love of turtles which stems mainly from the conservation work I did with them in Vanuatu years ago. My favourite marine creature which I see most times I’m out diving would have to be an Octopus. There are so many weird and wonderful facts about these intelligent animals and I think their abilities to camoflaugue themselves, multi-task and also escape are just really cool. Would you like to work alongside Jenny? COAST are currently recruiting two Volunteer Marine Programme Assistants. This article was originally posted at WiseOceans on 04/03/2018.